J_20-3A Series joints are heat-shrinkable kV-35 kV three-core armored joints for copper tape, drain wire and UniShield power cables. J_20-3A series joints kits come complete with everything necessary to splice the three-core armored cables except for the connector for the conductors and ground wires. Connectors must be purchased separately. • Heat activated seals provide the best moisture ingress prevention. • A tough outer tube provides mechanical and environmental protection for direct burial applications. • Tough wraparound sleeve provides mechanical and environmental protection with reduced installation space. • External ground kit with solder-blocked braid is included in all kits. • Slim profile allows for placement of joints in narrow trays or racks. • Fast repeatable installations from the first to the last joint of the day. • Wide application range allows for reduced inventory. • Heat-shrinkable components con form to out of round cables. • Rated to IEEE 404-2000.
copper braids, tinned copper mesh and stainless steel constant force spring clamps carry fault current across the joint. A galvanized steel wraparound armor case provide the mechanical protection for the joint. An outer re-jacketing sleeve is also provided to completely seal and encapsulate the joint. These joints are suitable for cable tray applications as well as for direct burial. Packaging: for these kits include one (1) each, three-phase armored kit per box. Boxes are labeled in accordance with IEEE 404-2000. Connectors for the conductor or ground wires are not included. diameter is within the range. This is important if your cable size is at either extreme of the range shown for the selected kit. 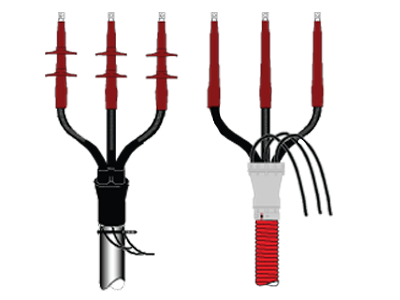 Class 1A, 5 kV-35 kV terminators for extruded dielectric (XLP/EPR), tape, wire shielded, or UniShield®, 3/C armored or unarmored cables. ﻿Outdoor Terminations are only required when subjected to direct precipitation or exposure to sunlight. The indoor version is acceptable for use in pad mounted enclosures. The T_3X kits without breakout boots are well suited for indoor applications and for use with armor terminators. T_3B kits are suited for outdoor applications or wherever a sealed crotch is desired. The T_3B kits contain three core jacketing tubes to keep the metallic shielding in intimate contact with the insulation shield of the cable. wire (s). A cable breakout boot and sealant are also provided to seal the crotch area of the three core cable. This kit is used whenever sealing of the three-core cable is required for indoor applications and always on outdoor applications. The T_3X kits contain three core jacketing tubes to keep the metallic shielding in close contact with the insulation shield of the cable. There are also three adhesive lined tubes for re-jacketing and sealing the ground wire(s). T_3X kits are used whenever sealing of the three-core cable is not required, or when an armor terminator (JAG type, for example) is to be used in conjunction with the kit for a sealed cable end. Contents: Everything is included to construct a three-core termination. 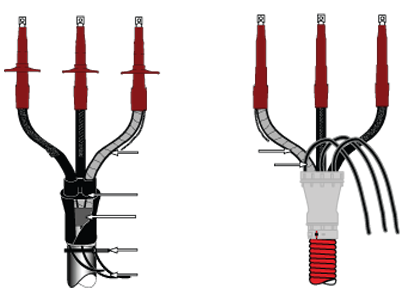 The kit includes three (3) single-core terminations, plus three (3) each re-jacketing phase and ground wire tubes. A cable breakout boot for sealing the crotch is also provided in the T_3B kits. Packaging: includes (1) three-phase kit per box. Boxes are labeled in accordance with the requirements of IEEE 48-1996.
the boot. Look up the conductor size for the voltage class of cable to be terminated. Select the indoor or Outdoor termination part number and confirm the dimensional data. This is important if your cable size is at either extreme of the range shown for the selected kit.